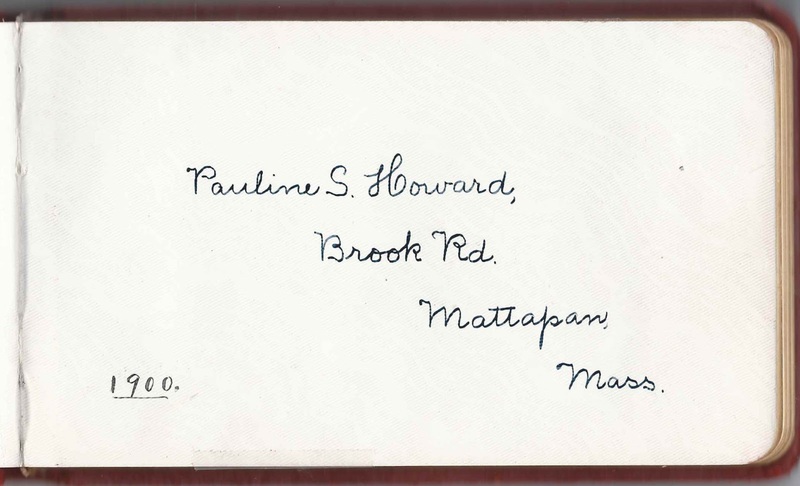 1900-1917 autograph album that belonged to Pauline Sumner Howard of Mattapan, Massachusetts. The album was found with two other autograph albums from the 1870s, albums that belonged to Pauline's mother Mary Ellen (Sumner) Howard. One of those albums is featured here, and the other is featured here. Pauline's album measures approximately 7" x 4-1/4" and contains the sentiments of over 50 of Pauline's relatives, friends and classmates. Some indicated they were attending Boston University, and others, S.N.S., which I presume was Salem Normal School, so named at the time. A few of the pages appear to have been collected as the autographs of "celebrities", such as a professor at the Smithsonian Institute, whose name I can't decipher, and the Governor of New Hampshire, Henry B. Quinby, among others. Pauline Sumner Howard was born 30 October 1888 at Boston, Massachusetts, the daughter of Frederic Theodore Howard and Mary Ellen (Sumner) Howard, who were born at Boston, Massachusetts, and Brookline, Massachusetts, respectively. One page was signed Mother, but also has the name Alice Carey, who signed the page at Milton, presumably, Massachusetts, on January 5, 1908. Pauline's mother Mary Ellen (Sumner) Howard was still alive at this time. Perhaps Alice was a housemother or the mother of a close friend. The flowers in plastic pasted on the left facing page have a notation that they were acquired at Letham, Scotland, in 1901. Another page was signed by Hazel E. Howard, who called herself Pauline's "Sister". I didn't find that Pauline had a sister, so perhaps these two young women were related otherwise or just found themselves, with the same surname, at the same school and affectionately called themselves sisters. On 20 October 1917, at Milford, New Hampshire, Pauline married Raymond Edward Stimson, son of Edwin/Elwin C. Stimson and Genieve/Geneva H. (Pickering) Stimson. Raymond was born 3 August 1883 at Hinsdale, New Hampshire. It appears that Pauline had moved to Amherst, New Hampshire, to teach. They had, I believe, one child, a daughter. 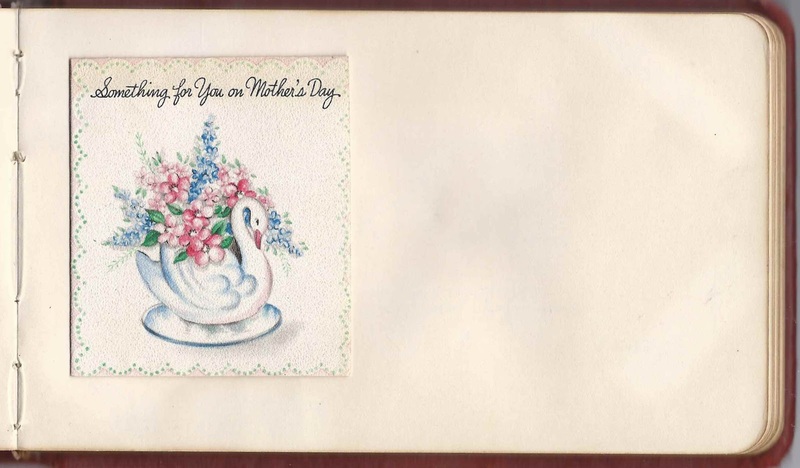 It was the daughter, I presume, who gave the Mother's Day card that's pasted in the album. 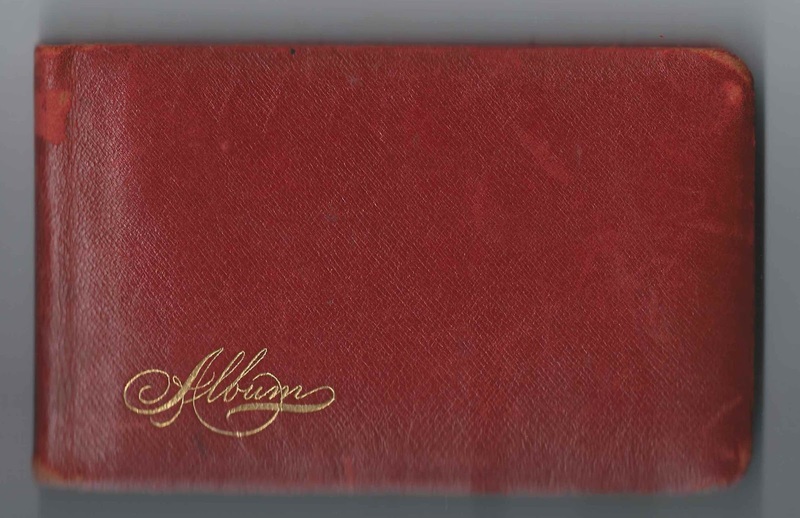 The album has several pages signed by members of the Weatherbee family of Milton, Massachusetts. These were Lillian Geneva (Howard) Weatherbee, Pauline's paternal aunt, and her husband Frank T. Weatherbee and children Elmer H. Weatherbee; and E. Earle Weatherbee. They all signed at Milton, Massachusetts, in 1905. Another interesting feature of the album is that six pages have photographs of the signers pasted on them, either from the beginning by the signer or added as an embellishment by Pauline. 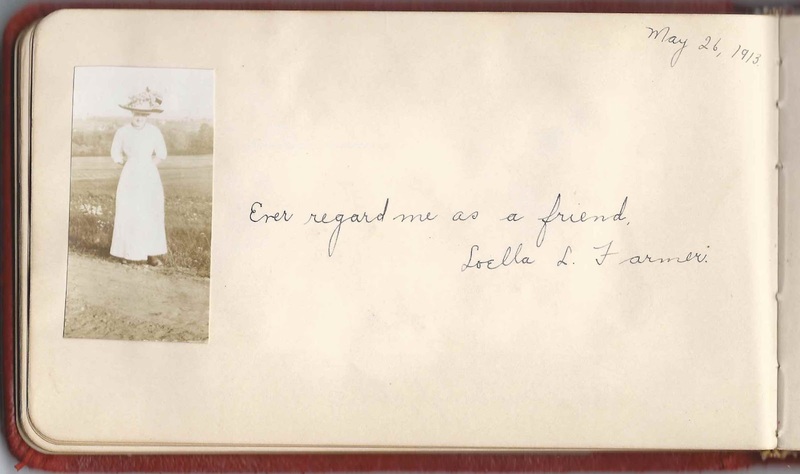 Loella L. Farmer signed a page on May 26, 1913. The page signed by Edna Weaver on June 12, 1906 has two little head shots, dated April 28, 1909, pasted on later, either by Edna herself or Pauline. A photograph of signer W. B. Garvin was cut into a heart shape; wonder if there's a story there? He signed his page on June 13, 1913. If you can decipher his middle name, please leave a comment or contact me directly. Note: As you can see from the comments section, a reader has found that the signer was Walter Burns Garvin of Richford, Vermont. 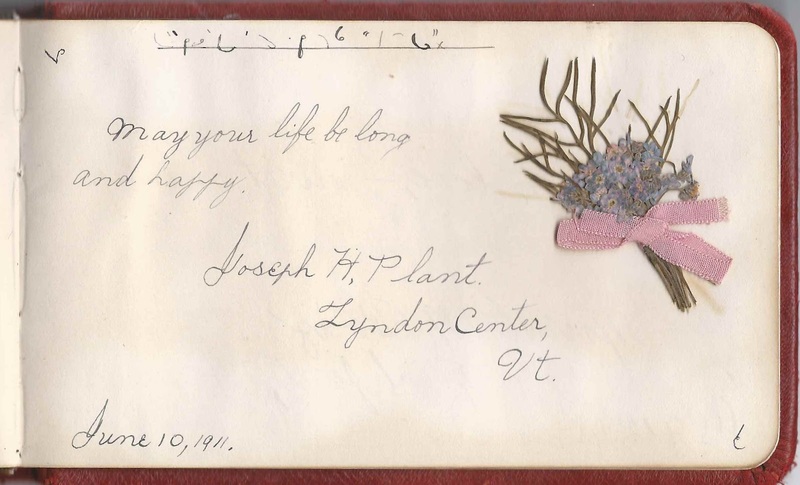 Joseph H. Plant of Lyndon Center, Vermont, who signed on June 10, 1911, pasted a bouquet on his page. Lucia Arcos, 18 de Septembre 563, Quito, Ecuador, S.A.
Marion Helena Blood of Derry, New Hampshire; "S.N.S. 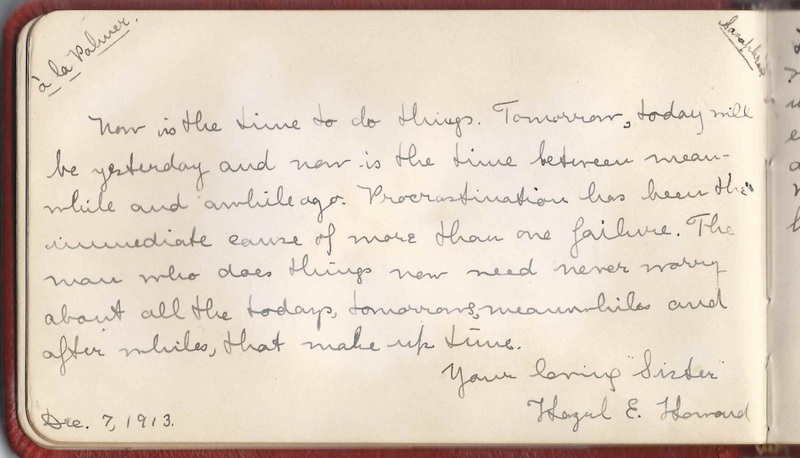 '10"
Margaret G. Burgess, signed on May 16, 1907; "your loving B.U.C. L.C. friend"
Murle Augusta Corson of Farmington, New Hampshire; "S.N.S. '10"
Loella L. Farmer, signed on May 26, 1913. She pasted a photograph of herself on the page. Jacob A. Fink, or Jacob H. Fink, signed at Lyndon Center [presumably Vermont], L.S.A., on June 29, 1913. He pasted on a little photograph of himself. W. B? 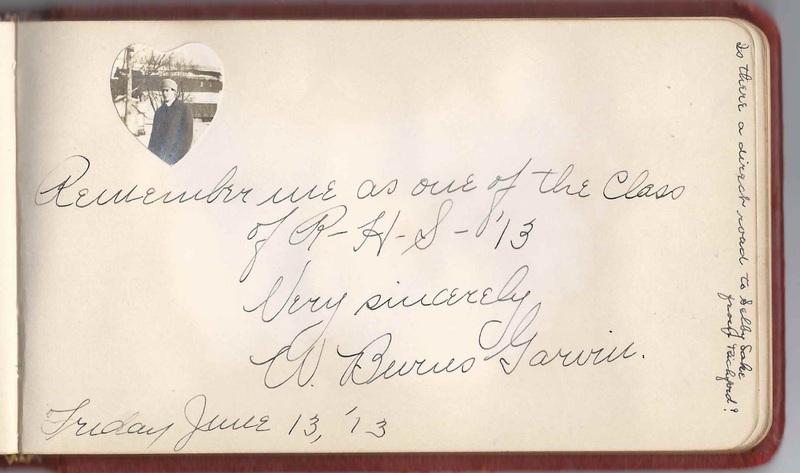 Garvin, member of the Class of 1913 at R. H. S., signed on Friday June 13, 1913. He pasted a little photograph of himself on the page, cut out in a heart shape. Olive L. Hayden; she pasted a photograph of herself on the page. Margaret Lee Henry of New Canaan, Connecticut, signed on October 27, 1909; "S.S.N.S. '10"
Harry Krim; pasted a photograph of himself on the page. Joseph H. Plant of Lyndon Center, Vermont, signed on June 10, 1911. He pasted a dried flower arrangement on the page. 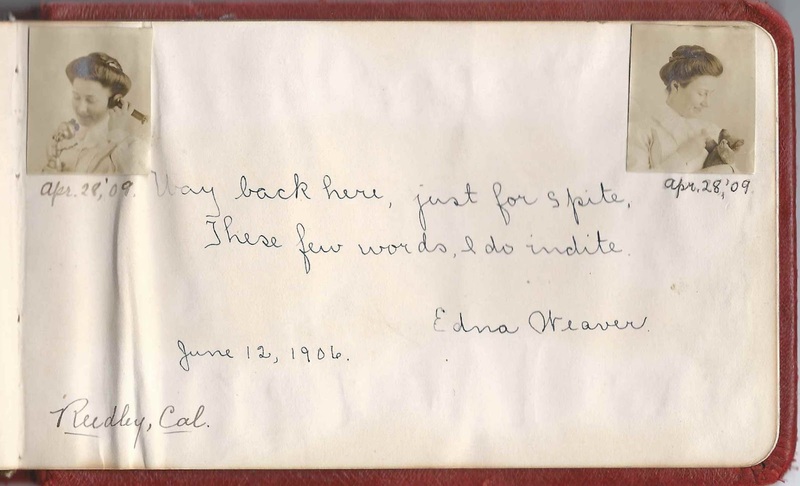 Edna Weaver, signed on June 12, 1906. She added two little photographs of herself to the page on April 29, 1909 and she or someone added "Reedley, Cal." My guess on the middle name is "Burns" W. Burns Garvin. Looking at identifieable letters n other known words, the second letter in the middle name is NOT an "e" because he does not make a single closed loop lower case "e." Also, looking at his "m" in "me" and the ending "n" in his last name, I think his "m" and "n" are so thin as to llok like "u"s rather tahn nicely rounded humps in "m" and "n." ALSO, I did a Google search on the name "W. Burns Gravin" and got this hit, which looks very promising http://archiver.rootsweb.ancestry.com/th/read/GARVIN/2004-01/1073571278. Let me know waht you think. Please pardon the awful typing in the last comment. I was rushing and also forgot to mention that the Google link shows W. Burns Garvin as having lived in Richford, VT. Since the inscription says "Remember me as one of the Class of R.H.S. '13" I think this fits if it refers to a Richford High School. Which must mean the book owner had connection to Richford, VT? Yes, you nailed it! And the rootsweb link even gives his first name, Walter. Thanks so much for tracking this down and letting me know.